Aside from the World Championships and the Olympics, there are five (5) other marathon races that are included in the World Marathon Majors: the London, New York, Chicago, Boston and Berlin Marathon. The Berlin marathon, attracts marquee athletes from the world over because of the sheer size of the prize: $500,000 for the 1st place (none for the 2nd placer) and the relatively flat and even surface which makes world record attempts possible. Last September 30, the Berlin went underway and as usual, went very fast. 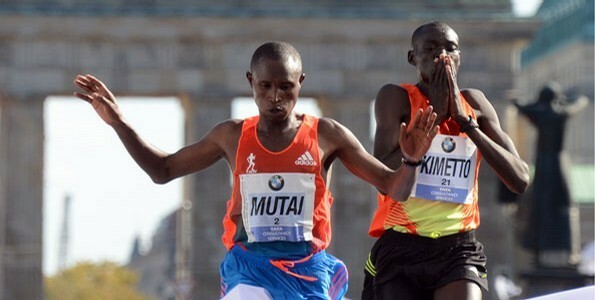 Though there’s a question whether they 2nd placer Dennis Kimetto deliberately lost to 1st place and world record holder, Geoffrey Mutai, both athletes cracked the top 10 All Time list with as they sneaked in at 6th ad 7th place. This entry was posted in On International Track News and tagged Berlin Marathon results, Kenya Athletics. Bookmark the permalink.